Before we get to the Friday video, a few site updates. Early next week, I'm excited to share an interview I conducted with a brand new author and someone I met to watch a Steelers game last fall. It turns out that we grew up about a mile away from each other, so there's some fun anecdotes about Pittsburgh's eastern suburbs. I've also been away for much of July, so I'll have a blog post or two about traveling with kids. Your Friday video is The Sound by The 1975. I'm all for a band named in honor of my birth year. Anyway, I was actually awake on a spring Saturday evening and saw the band perform this song on Saturday Night Live. I enjoyed it, and then I didn't hear the song again until the last week or two. By the way, what's wrong with Huey Lewis? I like his work with The News. When I first heard Disturbed's cover of Simon and Garfunkel's classic song "The Sound of Silence," my initial reaction was what the heck* is this? Now that I've heard it a few more times, it's really grown on me. This version is a bit haunting but with the same outstanding lyrics from 50 years ago. So now, here's Disturbed with my all-time favorite 2016 cover of a song from 1964. * I used a word other than heck. On Sunday, I took The Moose to his second professional baseball game to see the Pittsburgh Pirates against the Washington Nationals. The Moose witnessed a no-hitter and near perfect game in his first game last year, so there was no way that this game could match its significance, right? Please note that this post mixes a recap of the game with my own thoughts and quotes from my five year old. For example, upon seeing Pirates first basemen John Jaso, The Moose said, "He has girl hair." Back to the game. All-Star and former Cy Young Award winner Max Scherzer, the pitcher who threw the no-hitter last season, matched up against Pirates rookie Chad Kuhl. Not an ideal match-up for the Bucs. As I know now though, DO NOT UNDERESTIMATE CHAD KUHL. All Kuhl did was throw 6 scoreless innings of one-hit baseball. More on Kuhl later. With the Pirates leading 1-0 in the bottom of the ninth, the Nationals played AC/DC's Thunderstruck as Pirates pitcher Mark Melancon warmed up. The Nats probably thought they were pumping up the crowd, but this is also Melancon's entrance music. 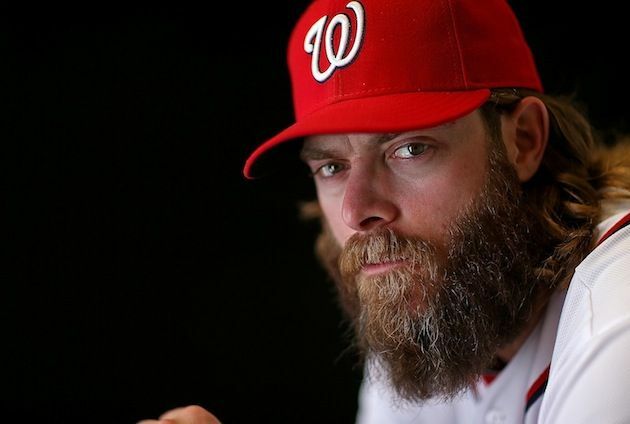 Arguably the best closer in baseball over the past 3-4 seasons, Melancon retired the first two Nationals before All-Star and this season's best hitter, Daniel Murphy pinch hit. With a 2-2 count, Murphy did this. And this was The Moose's reaction. And what was a not too exciting of a game turned very interesting. The game went on to the 10th inning and then the 11th. And the 12th. Throughout this, my friend and I discussed how long we would stay. Although we were in the shade, it was still over 90 degrees and we had three boys ages 5, 6, and 9, who we knew only had so much patience. In the middle of the 13th, there was a second Presidents race. The Moose was a bit freaked out by the giant Presidents. (Yet, when we left, he wanted to stay to see another Presidents race even though that wouldn't have happened until the 22nd inning! By the way, major props to the people in the Presidents costumes who were still there well after all beer sales ended and most food concessions closed.) And then there was the traditional 14th inning stretch! We moved our seats a few times, once in the 10th or 11th inning to get out of the sun which started hitting our backs and then to seats on the third base line about 20-25 rows from the field. Again, being in the shade was huge! We interrupt baseball for The Moose's thoughts on Nationals outfielder Jayson Werth. "He has a scary beard." (When in the on-deck circle) "The bad guy is going to be next." I can't disagree with any of these assessments! We made it through the 15th inning, approximately 5 hours in the stadium, and that was it. Of the announced attendance of 32,775, we outlasted at least 20,000 people. That's a lot of baseball for three little guys. While walking to the parking lot in the 16th, we heard a loud roar. Did the Nationals have a walk-off win? Fortunately, no. As I heard on the radio, Pirates Josh Harrison hit a double, but Eric Fryer was thrown out at the plate by a perfect relay from Nats' center fielder Michael Taylor to SS Danny Espinosa to catcher Wilson Ramos. - Including Sunday, Chad Kuhl has started four baseball games. He pitched against probably the best pitcher in baseball Clayton Kershaw, the May 2016 AL pitcher of the month and should have been all star Rich Hill, three-time all star Jon Lester and now Scherzer. The Pirates are now 4-0 in his starts. Can he start against some below average pitchers some time? - When I was in college, I had an internship with a Pittsburgh-area Congressman. We also had an office softball team and played against a local fire department twice (and against a Senator's staff too...we destroyed them). Anyway, I annoyed many of the firefighters for constantly getting on base in our games. I was not a power hitter, yet I managed to get hits through seeing-eye singles or balls that landed between the infielders and outfielders. Why do I mention this? Pirates rookie Adam Frazier is me 20 years later. (Well, at least in this analogy.) When you look at the Pirates line-up, teams are going to be concerned with Marte, McCutchen, Freese, Harrison, Mercer, and others. Yet, Frazier went 3 for 6 Sunday with two walks. For the season, he's now hitting .355 with a .412 on-base percentage. He must be such a pest for opponents. - The Moose's thoughts on National's 23 year-old Trea Turner: "He is a kid." So The Moose has now been to two games, one a no-hitter and the other went 18 innings. He's going to be disappointed someday when we attend a regular 4-2 game! Want to know more about the game? 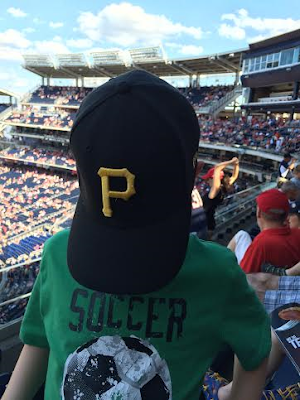 Here's the recap from The Washington Post, ESPN, Bucs Dugout, and Pittsburgh Post-Gazette. I am a terrible cook. If there was a television show called "Bottom Chef," I think I could be a contestant. Yet, as a father, there are times when I have to make edible food for my kids. I make an excellent Mac and cheese (out of a box, but it's still really good) and can warm up fish sticks and chicken nuggets on par with any Food Network chef. However, I don't have much of a repertoire. Oh, I can also make pizza bagels WITHOUT ketchup. 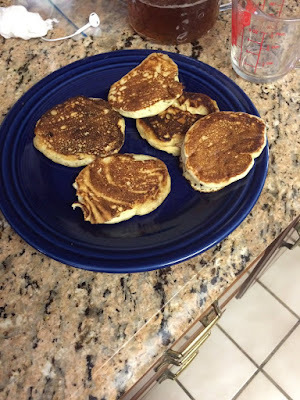 On Tuesday, it was breakfast for dinner night so I attempted to make pancakes. I probably put in too pancake mix, and despite the instructions putting DO NOT OVERMIX in all caps, I probably overmixed. With all of that written, I think the pancakes came out okay. And with that dinner was served. As soon as I put the plate in front of him, my five year old (The Moose) said, "I don't want pancakes." All he ate for dinner was a yogurt and one strawberry. He had a big lunch, so apparently, he wasn't hungry and even skipped his evening milk. Meanwhile, my two year old (Pedro Tulo) ate about half of one pancake, yet still managed to get syrup all over him and his clothes. He also ate yogurt and strawberries as well as his milk. While I wouldn't call breakfast for dinner a disaster, this seems like far from a success. Oh, as an added bonus, I put the plastic mixing bowl too close to the pan. As a result, no more mixing bowl! Ever wonder about your vocabulary size? Even you are a daily English speaker or a native English speaker, you still might find this test challenging! We conducted academic research and looked at online resources to design the model of this quiz. We believe we've prepared the best quiz for you! Personally, I think there's some type of mistake here. There's no way I should have done this well. My SAT verbal scores weren't very good, so there must have been a lot of lucky guesses. On Sunday, Portugal defeated France to win the 2016 European Championship. This was Portugal's first major soccer championship in arguably the sport's second biggest event following the World Cup. So to celebrate, let's listen to some Milli Vanilli! Blame it on the rain yeah yeah. Blame it on Spain yeah yeah. So in honor of not blaming Portugal all these years, I'm happy for the country which will probably celebrate winning Euro 2016 for a long time. Season 69 of the Learned League ended last week, and I dominated questions related to television where I got 9 of 10 correct. Unfortunately, I went 0 for 17 on science questions, 1 for 13 in world history questions, and 3 of 12 in geography questions. With the season over, I thought I would share some of the television questions for a rare edition of Trivia Tuesday. 1. Sasha Alexander has appeared in regular roles on the television series Shameless, NCIS, and most prominently as one-half (with Angie Harmon) of the titular crime-solving duo on what show? 2. A current unconventional television sitcom's optimistic title character, rescued after fifteen years of captivity under Indiana cult leader Richard Wayne Gary Wayne, moves into a basement apartment in NYC with an outlandish roommate and a nutty landlady to start a new life. What is the name of this character? 3. While New Jersey was the iconic setting for The Sopranos, what other HBO TV series, which ran from 2010 to 2014, was also set in the state? 4. In October 1986, the nascent Fox Broadcasting Company network broadcast its first television series, The Late Show, which was hosted by what former "permanent guest host" of NBC's The Tonight Show Starring Johnny Carson? 5. Psych, Monk, Suits, Dig, and Smush are all television series that were first broadcast on what network? 7. The two-hour syndicated primetime television special The Mystery of Al Capone's Vaults was broadcast live on April 21, 1986, in hopes of finding the gangster's guns, money, or dead bodies, but it resulted in the discovery of nothing but debris (and huge television ratings). Who hosted this special? 8. What three-word phrase (which is the same word uttered three times) forms part of the chorus of the Sesame Street tune "Monster in the Mirror" and was also the catchphrase of Club MTV host Downtown Julie Brown? 9. Name the actress who has been nominated for a Primetime Emmy Award for Outstanding Lead Actress in a Comedy Series in nine of the last ten years, after being nominated in the Supporting category for seven straight years from 1992 to 1998. 10. Although Arnold Schwarzenegger is slated to take over the franchise in the 2016—17 television season, to date, every season of all American versions of the NBC reality series The Apprentice (including spinoffs/variations) was hosted by Donald Trump, with one exception. Who hosted this non-Trump Apprentice, which aired in the fall of 2005? Please leave your answers in the comments section below and don't cheat. Good luck! Questions courtesy of the Learned League.